Imagine a whirlwind approaching and the one idea you have is to penetrate it so you can experience the eye of the storm. Francis Alÿs, an artist who is known for his sardonic political statements through mediated events in which he himself often performs, did exactly this over a period of ten years and recorded it in a video, Tornado. The work could be understood as a metaphor for entering into the nature of a phenomenon through its exterior appearance and of getting mixed up in the unpredictability of the encounter. Ula Liagaitė, who trained at the Northern School of Contemporary Dance in Leeds, was inspired by Alÿs to imagine how she might adapt his poetics of the unattainable in choreographic terms. Her body has the same materiality but the whirlwind has become a cylindrical metal sculpture by Liagaitė’s sister, Bartė, a free-standing structure with a vertical axle connecting two broad, horizontal cylinders, part double boiler — the initial lighting gives it a copper colour — and part smooth industrial gearing. Liagaitė prepares for the encounter in a choreographic prelude based of a mix of boxing and classical dance comprising fast footwork, hands held close to the chest and the bobbing, ducking gestures invoked against an invisible sparring partner; she is both protective and pugnacious. She punctuates the sparring by dropping to the floor like a puppet whose strings have been loosened. Wearing a casual, loose-fitting, gold-coloured robe, Liagaitė’s dancing figure contrasts with the stillness of the cylindrical construction; in the darkened studio with a single light that spills on both we witness the close but unresolved relationship between the two. Finally, when she is ready — and as Mikas Zabulionis’ rumbling score reaches a shrill climax — she crosses the short distance to the cylinders to begin her duet. Liagaitė writes in the program note that, like the experience of watching Tornado, ‘this piece is about a particular feeling that there’s always something bigger than us.’ The duet that is about to happen is already inevitable because the two objects, one human and one mechanical, are drawn to each other by both the object’s offer of experience and Liagaitė’s will to accept it. She approaches the object with reverence before familiarizing herself with its surfaces; there is something of an encounter between two lovers, sensing the perimeters of the body and its contours. However, getting inside the structure was never going to be seamless; Liagaitė has set herself the choreographic task of climbing into a sculptural object that is static — unlike the whirlwind — in order to fulfil its promise of motion. A slight hesitation is perhaps expected at the threshold of a new experience, but once the resistance is overcome Liagaitė sets the cylinders turning from her invisible place inside. We only hear her breathy voice above the whirling sound as a witness of her achievement: ‘I might just be here in the heart of the storm…I feel like I have no control over this thing…’ The duet has started and the pair remains in a dynamic, poetic embrace until the end. 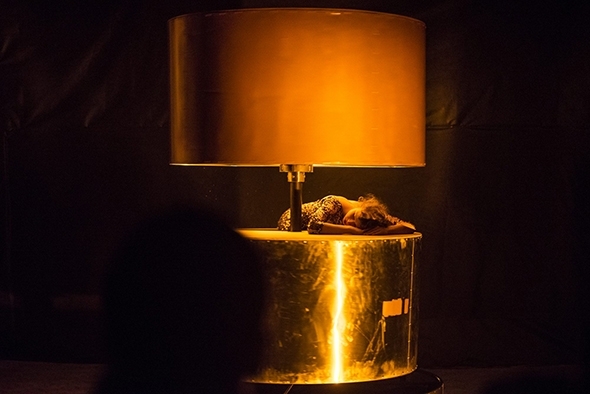 This is the most successful part of the performance — and perhaps the crux of Liagaitė’s vision for the work — in which light, sound and the sensual duet of body and machine converge. As an acknowledgement of the idea of a whirlwind, Liagaitė loses her gown somewhere in the depths of the structure so that when she rises above its turning rim her naked torso is juxtaposed with the polished surfaces and the lighting projects flame-like reflections on her body. Shadows and burnished metal turn slowly before us as Liagaitė’s dancing body sits calmly, climbs or leans out from her mechanical partner in perfect equilibrium, urging on the revolutions to heighten the sense of motion and emotion in her union. She drops down to the floor holding on to the rim and lets the dynamic of the whirling cylinders dictate her momentum of repeated phrases of abandoned falling, slithering and turning. There is a question of who is in control, but as the momentum dies down and the cylinders come to rest, she finds composure sitting on the rim, flushed but with a sense of regret, as if to say, ‘I’ve achieved what I wanted but I’m sorry it’s over.’ Fetching her gown and putting it on she returns to her sparring in the single light until the darkness and a sense of calm descend. The duet has happened.